Hear Schütz’s sublime masterpiece, Musikalische Exequien, with C. H. H. Parry’s matchless Songs of Farewell on the hundredth anniversary of its composition. Amor Artis and instrumentalists from New York Baroque Inc. (hailed as “truly excellent” and “studded with stars in the making” by the New York Times), will perform Musikalische Exequien, an innovative three-part cantata written in 1636 on a collection of texts reflecting on the end of life. 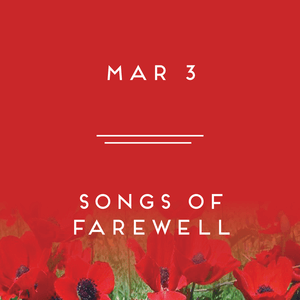 Interspersed with Schütz’s music will be Parry’s Songs of Farewell, some of the most moving and finely crafted works for a cappella chorus to come from the 20th century; and Caleb Burhans’s Prepare for Death and Follow Me, written to be heard with Schütz’s masterpiece.